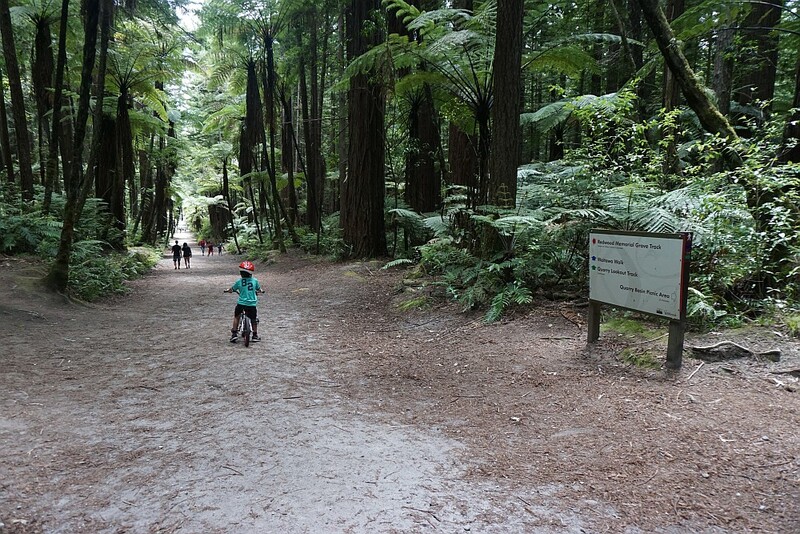 The Quarry Track in the Whakarewarewa Forest is a loop track of just over 4.5 kms starting and ending at the Redwoods information centre on Long Mile Road, off Tarawera Road. 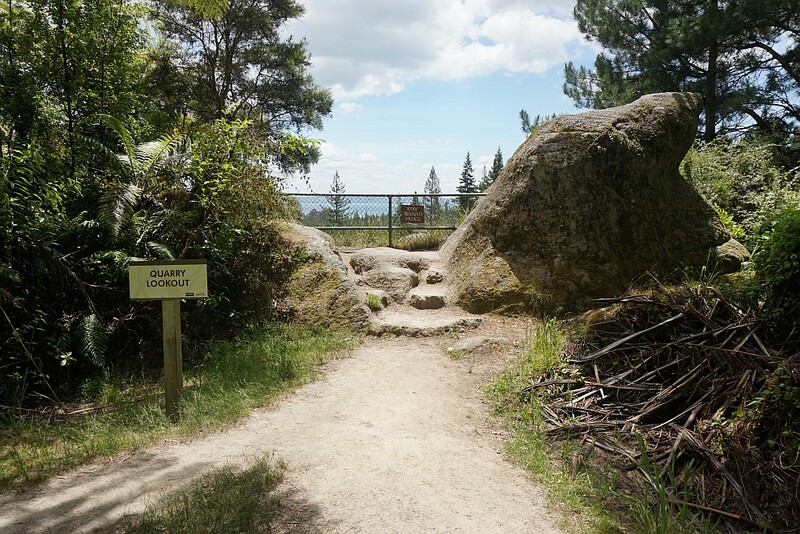 For information about the parking and other facilities at the information centre, and the start of the Quarry Track, see the previous post about the Pohaturoa Track. 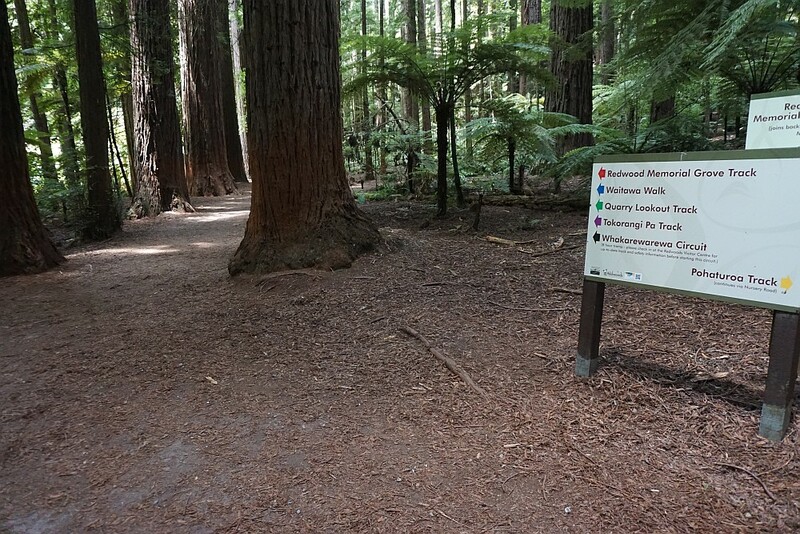 The first part of the Quarry Track is shared with the 5 other marked walking tracks in the Whakarewarewa Forest, starting and ending at the Redwoods information centre. 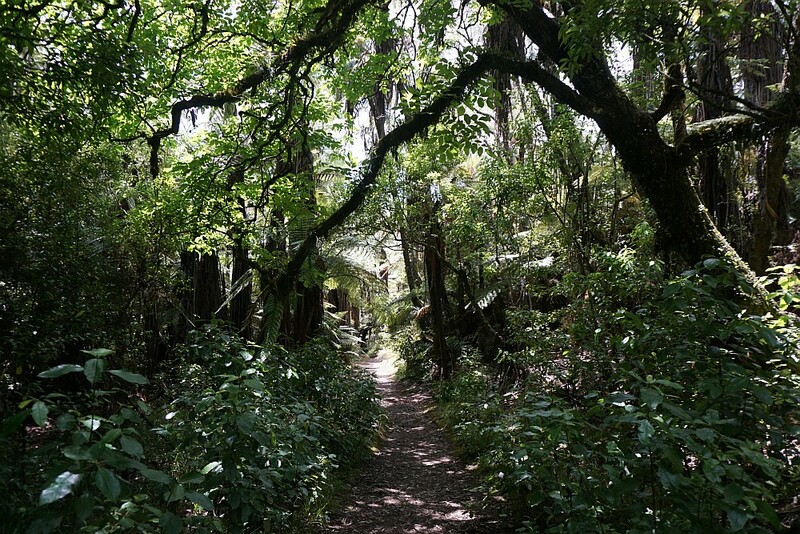 It passes through part of the redwood forest, before the Pohaturoa Track branches off from the other tracks. Another branch, before the Quarry Track (or Quarry Lookout Track) starts the uphill leg to the lookout. The Quarry Track continues to the left, the Tokorangi Pa Track and the long tramping track branch off to the right. 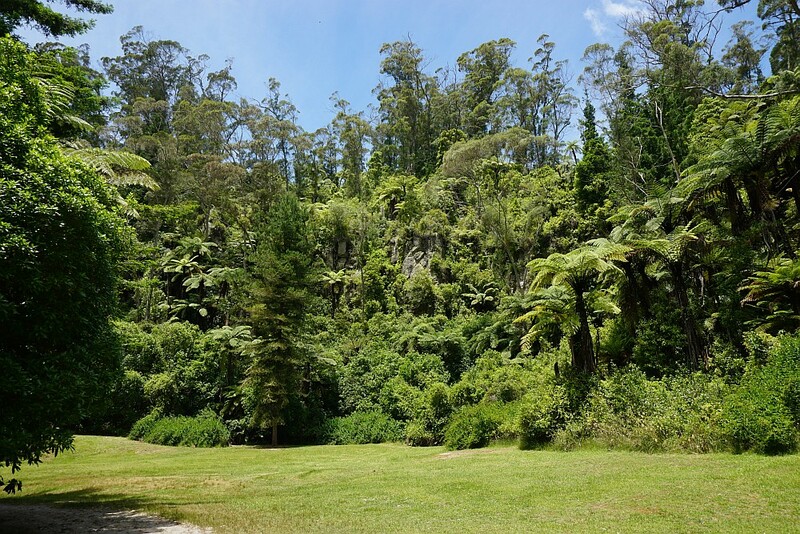 The Quarry Track passes through some regenerating native forest on the way to the lookout. There are numerous steps to climb along the way. The lookout, at the top of the rock wall from the disused quarry. Looking down at the floor of the quarry. Lake Rotorua can be seen in the distance at the very top of the photo. 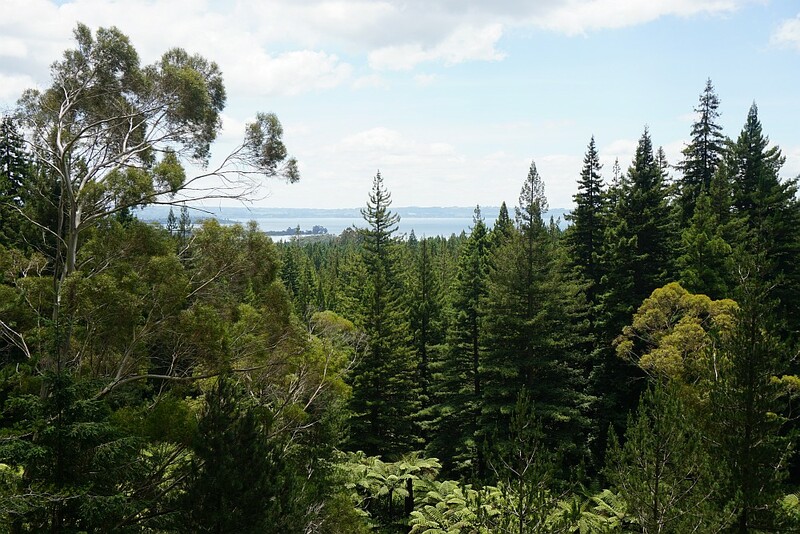 The view from the lookout to Lake Rotorua. 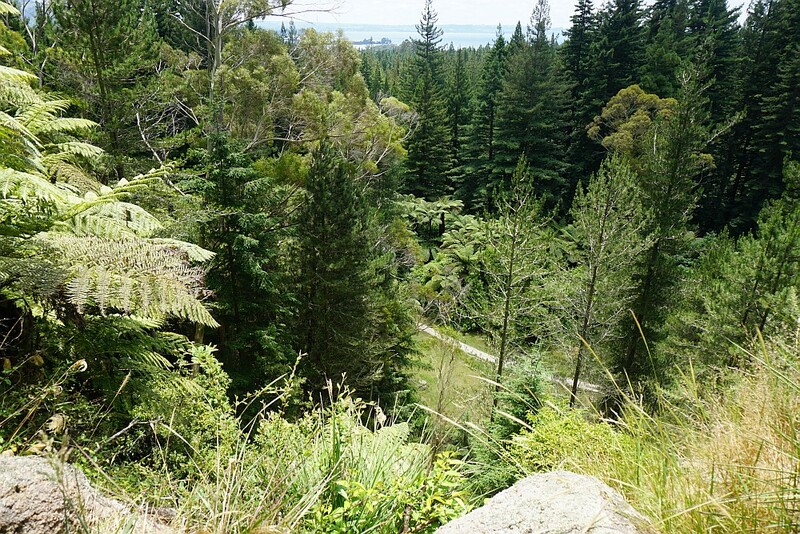 The descent from the lookout is fairly steep in places, with formed steps most of the way. 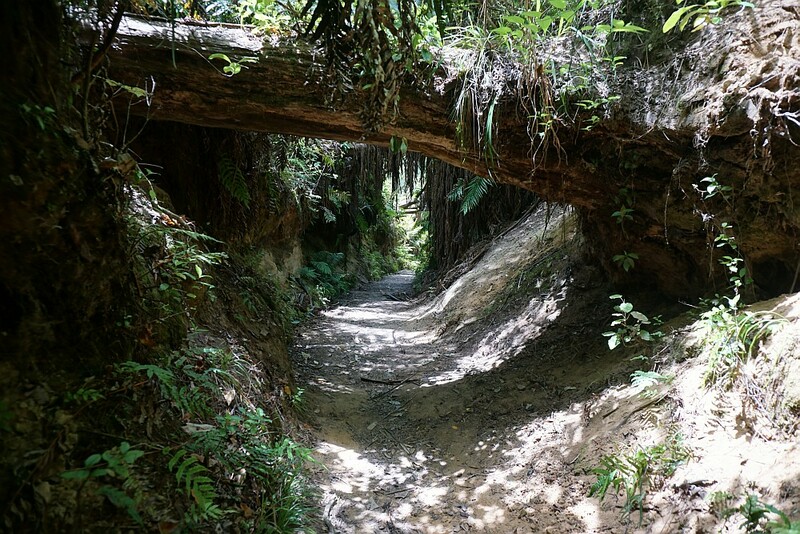 Part of the descent is down a channel, with several fallen trees still lying above the track. The base of the quarry, now converted to a pleasant grassed area. Looking at the rock wall, now overgrown, to the lookout at the top. 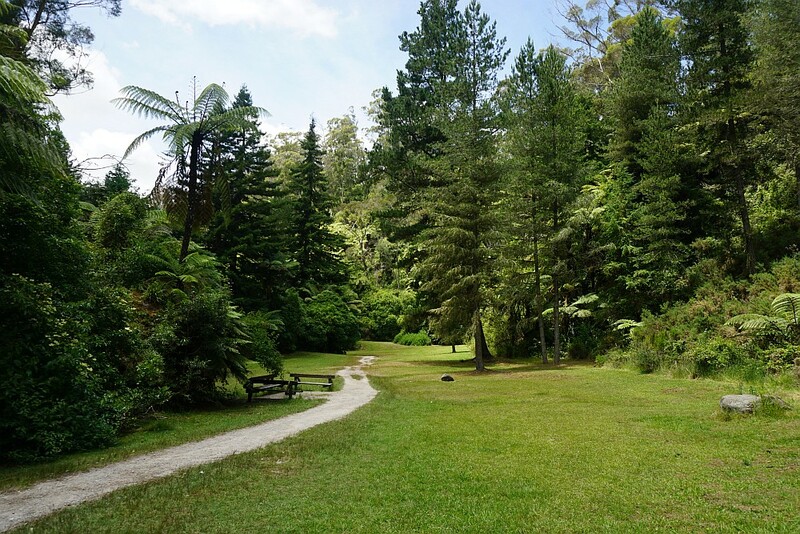 The Quarry Track runs parallel to Tarawera Rd for some distance, heading down towards Long Mile Rd. 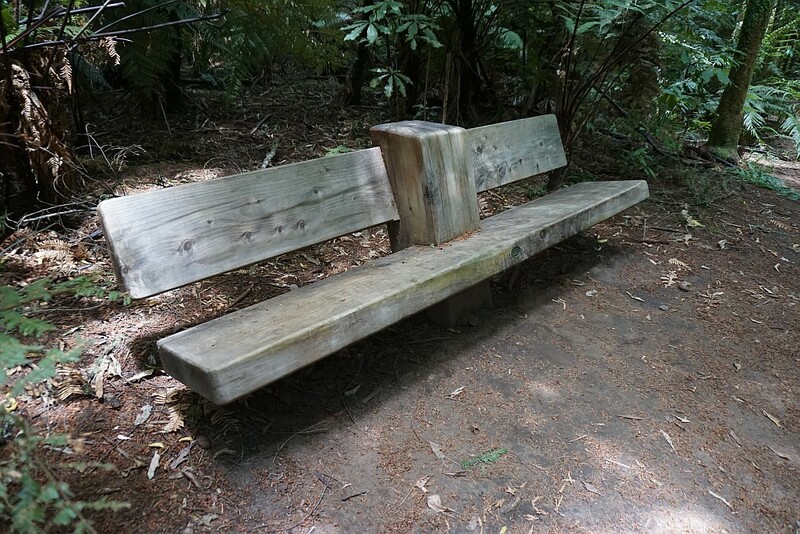 There are several solidly constructed bench seats alongside the various tracks through the redwoods. 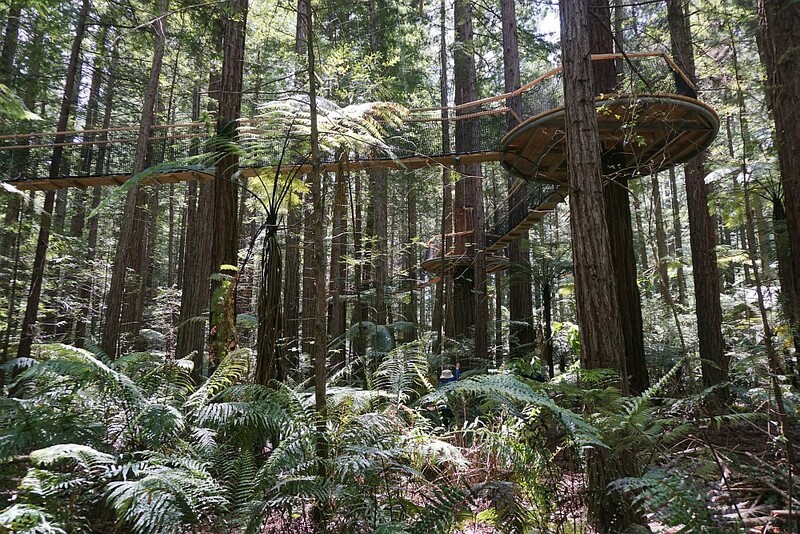 A 550 m long treewalk, with suspension bridges connecting platforms suspended in some of the larger redwood trees is currently being constructed in the forest. 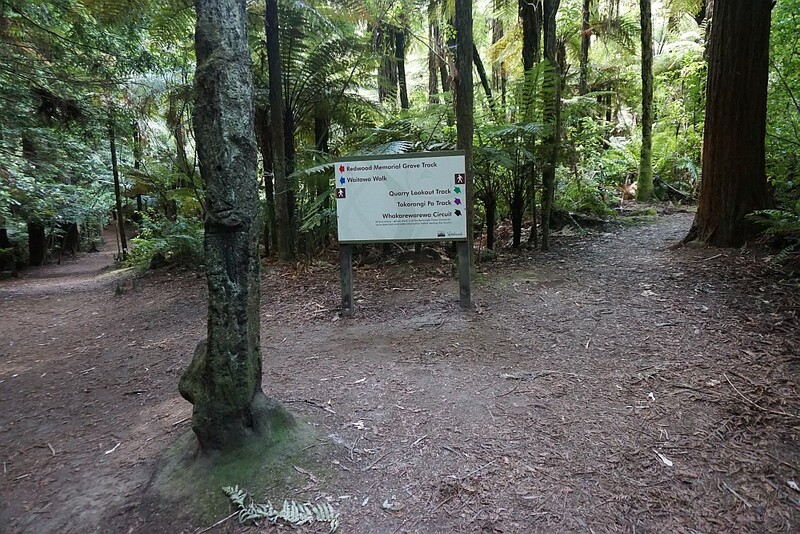 The Quarry Track runs parallel to Long Mile Rd as it heads back to the information centre, passing alongside the treewalk on the way. 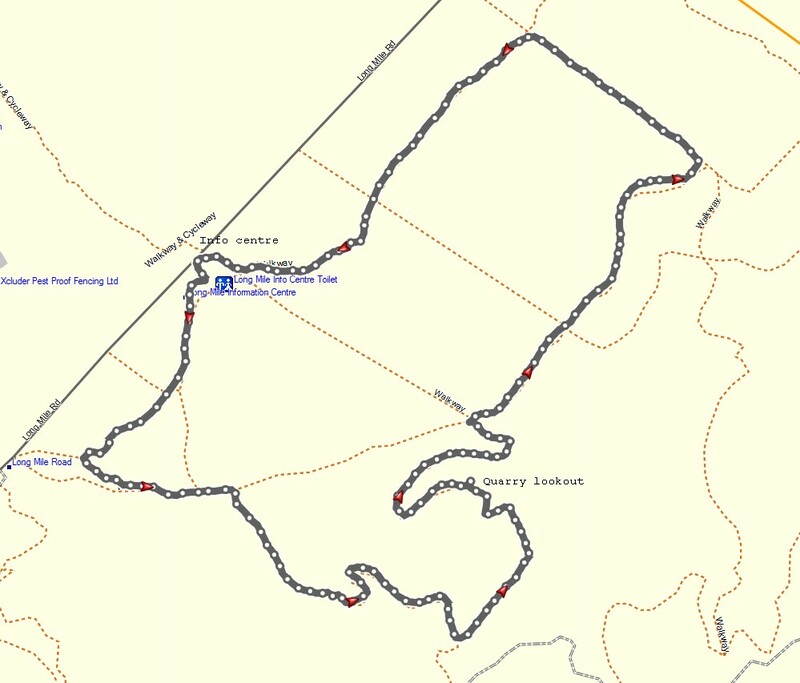 The GPS tracklog shows the path walked, starting and ending at the information centre, and traversed in an anti-clockwise direction. The lookout is marked on the map. A topographic map and satellite image of the area can be seen in the Pohturoa Track post. Lowest point is about 310m above sea level, and highest about 420 m.
The total distance walked was about 4.6 km, and took 1 hour 10 minutes. 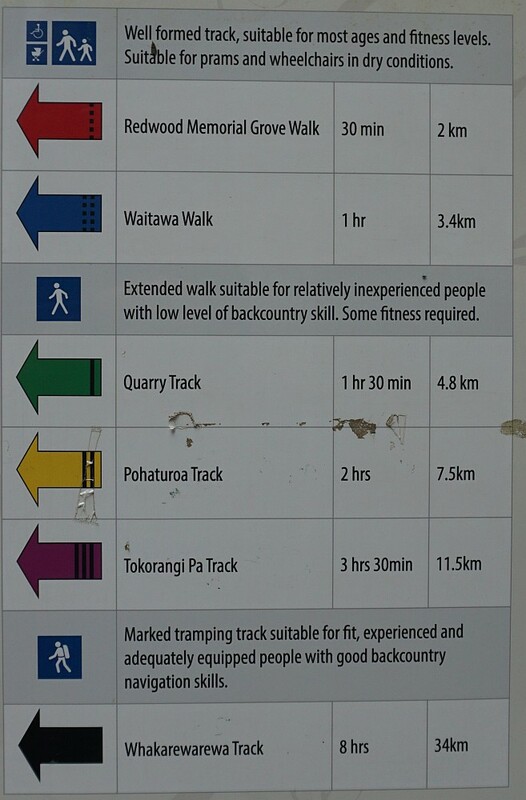 The walk was done on December 20, 2015, after the Pohaturoa Track walk. 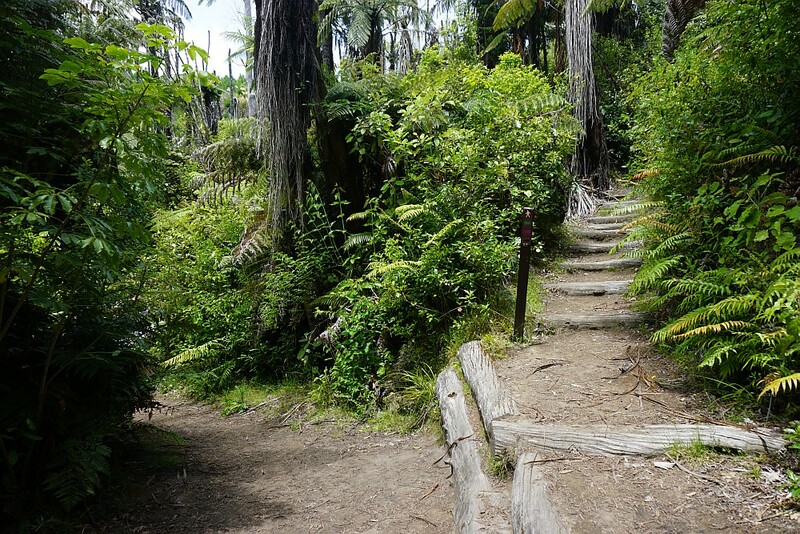 This entry was posted in Walks and tagged Quarry Track, Rotorua, The Redwoods, Whakarewarewa Forest on 2015-12-21 by nzartig.